The New Year is an apt time to reflect and to set down our goals and aspirations—one of mine being the starting of this blog—and I can’t help but also reflect on the crucial role small businesses will continue to play in our economy and our communities in 2016. Entrepreneurs and small business owners are Canada’s lifeblood. They employ nearly half of Canadians working in the private sector and contribute 30%—nearly a third—to the country’s GDP. We are also a nation of entrepreneurs; a report released in 2015 found that Canada tied for second in the world in entrepreneurship1 with 13% of the working-age population involved in early-stage companies. The impact of small businesses on our country’s financial state is all the more telling during times of economic recovery. American economists have frequently attributed small business slow-down as one of the key reasons for that country’s slow-going economic recovery. On the flipside, our small businesses have been an engine for economic recovery here in Canada. 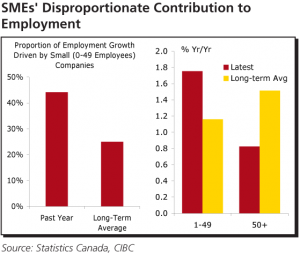 Although tides for small businesses have recently shifted, early in our economic recovery they outperformed the broader economy, according to a report from CIBC2. 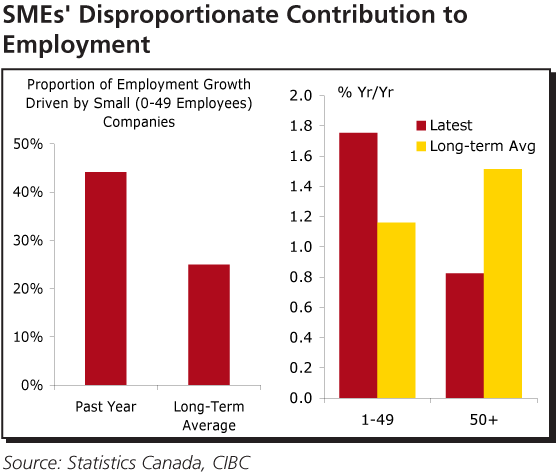 That same report showed that since the last global recession, small businesses have generally become a bit larger and in 2014, despite their own economic challenges, contributed a much greater-than-normal share to the hiring of Canadians. But the impact small business owners have on our national economy is only part of the tremendous value they have and contribution they make. Looking more specifically at the lumber and building material and hardware industry, the business owners—many of whom are second- or even third-generation dealers—are the heroes of their communities. They are the ones battening down the hatches during a downturn, such as what’s happening in Alberta; they hunker down as sales dip during a recession and in the face of faceless corporate entities. While those corporate big-box stores merely mine communities to maximize profits for shareholders, independent dealers take weighty risks, buying inventory, hiring staff and making significant commitment to the community. During tougher economic times, when big-box retailers “restructure” and eliminate jobs to please investors 3, Canada’s independent dealers get creative and become more industrious. They do whatever they can to survive and thrive, often turning adversity into opportunity. What independent dealers bring to the table cannot be easily mimicked by larger corporations. In their bid to remain competitive, small businesses tend to attract the best talent and bring to bear greater innovation. With their finger on the pulse of their customer, small businesses are more adept at adapting to changing economic weather; as the adage goes: You cannot change the wind, but you can adjust your sails (or sales). Canadian small businesses are masters at responding to the winds of change. And the customer-centric focus they share breeds the loyalty that helps to keep them afloat while others sink. 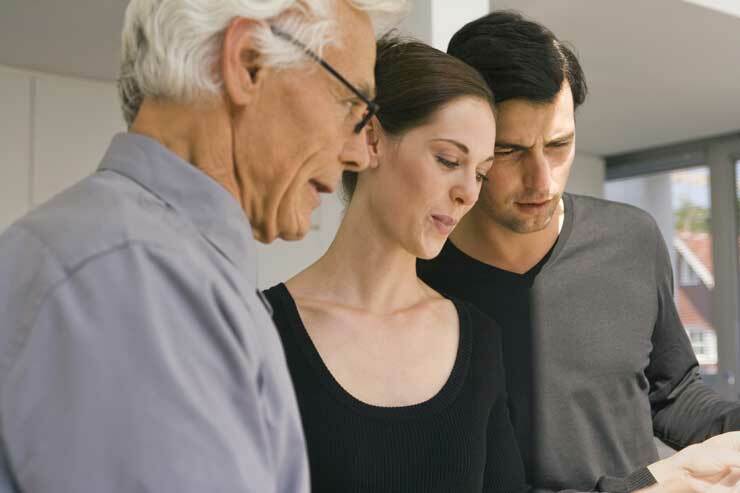 Second- and third-generation dealers in particular bring a unique value proposition: they have the nimbleness needed to compete coupled with the customer-focus and survival skills passed down from parent and grandparent owners. Raised in the industry, these small business leaders could have easily become employees of larger corporations, but instead struck out and reinvested into their communities. The successes of local LBM dealers are really the successes of local communities. As they thrive, generate revenue and ultimately pay higher taxes, those funds strengthen (and sometimes revitalize) communities and their local services, from schools to fire halls. So, as we reflect on all we have to achieve in 2016, let’s remember the tremendous role small business and Canada’s independent LBM dealers play in our collective successes. Happy 2016! Love the blog idea and will anticapte the next issue. Small business owners are a breed of their own and provide strength, knowledge and community presence. Thank goodness for the entrepreneurs in Canada.